The Milwaukee County Zoo's bonobo population has increased once again. Ten-year-old Deidre gave birth on November 21 and 14-year-old Zomi gave birth on December 1. The infants weigh approximately three pounds each and are nursing from their mothers and thriving. They are also being cared for by other bonobos. 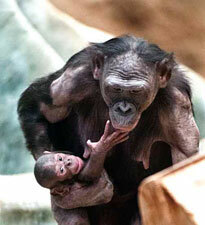 To spot bonobo babies on exhibit, look for bonobo adults carrying the babies tightly on the adult's stomach. There are an estimated 190 captive bonobos in Europe and North America combined, so each birth is significant to the overall population. 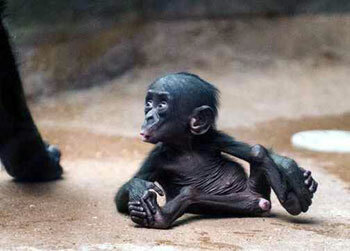 Currently, the Milwaukee County Zoo has one of the largest captive bonobo collections. These recent births, added to the two bonobos born in May and June of 2013, bring the Milwaukee County Zoo's total bonobo troop count to 20. Visit the bonobos daily, in the Zoo's Apes of Africa building.